Mahmoud Abdul-Rauf is 48 years old and he’s in an LA Fitness about 15 miles west of Atlanta. He’s getting frustrated. Abdul-Rauf is not happy with the way his jumper is falling. So he’s pushing, relentlessly, with the same behind-the-back dribble. Then two more dribbles to the baseline. And then a jumper about 15 feet from the basket. Abdul-Rauf drills for an hour and a half, shooting from midrange, from the 3-point line, from the corner. Shooting from the wrong foot, shooting off balance. When he’s done shooting, he battles Deaundrae Ballard, a four-star recruit headed to the University of Florida this season. Abdul-Rauf, who has been training Ballard and prepping him for his college career, squares up with the novice, who’s at least 6 inches taller. Three-pointer. Wet. Repeat. The sounds of other basketballs hitting the gym floor disappear. The other ballers getting in morning workouts have stopped to watch. Another 3. Swish. His gray sweatpants and royal blue shirt are drenched in sweat. It’s also dripping from his salt-and-pepper goatee. Former NBA player Mahmoud Abdul-Rauf, who will play in the BIG3 league, works on his handles while training for the start of the league. Abdul-Rauf shoots for two more hours. He’s done some variation of this routine every weekday since he was a Louisiana State University standout. But he’s going harder now than he has in a long time. The former Denver Nugget scoring machine, who was Colin Kaepernick before Colin Kaepernick was Colin Kaepernick, is gearing up for another chance at the national stage. He’s got a new team, the 3-Headed Monsters, with teammates Jason Williams, Kwame Brown, Rashard Lewis and Eddie Basden. And he’s got a new league to conquer. Abdul-Rauf is getting ready for the BIG3. The phrase “dog days of summer” originated more than 5,000 years ago as a way to describe the months when the Dog Star, Sirius, would make itself most visible. Some believed The Dog was the cause of July and August heat. For the past century, afternoon baseball games have been a hallmark of those hot and lazy summer days, as fans flock to fields across the country to pass time with the heroes of the diamond. Yet, over the past 20 years or so, baseball has had an ever-decreasing impact on American culture, especially for African-Americans, who as of 2013 make up only 9 percent of Major League Baseball fans, far behind the black fanship of professional basketball and football. For black folks, the dog days of summer, the season between June’s end of the NBA and September’s beginning of the NFL, are even more dogged because of the lack of sports they care to watch. That’s where Ice Cube and his BIG3 come in. “Summer is boring as s—,” Ice Cube said at a January news conference announcing the BIG3, billed as America’s 3-on-3 Professional Basketball League. The league features former NBA players, most notably Hall of Famer Allen Iverson, in half-court games. It’s set to tour over the summer and to culminate in a championship game at Las Vegas’ T-Mobile Arena on Aug. 26. The league, which launches on June 25, comprises eight teams (with names such as “Power” and “3’s Company”) of five players each: three starters and two reserves. All are coached by legends such as Julius “Dr. J” Erving and Clyde Drexler. From a distance, the BIG3 may seem like a novelty gig, a chance for nostalgia ballers to hit a few crossovers for YouTube and Instagram before retreating back into retirement. But a closer look at the league reveals passionate players, a brain trust and an organization that aims to be America’s second major pro basketball association. 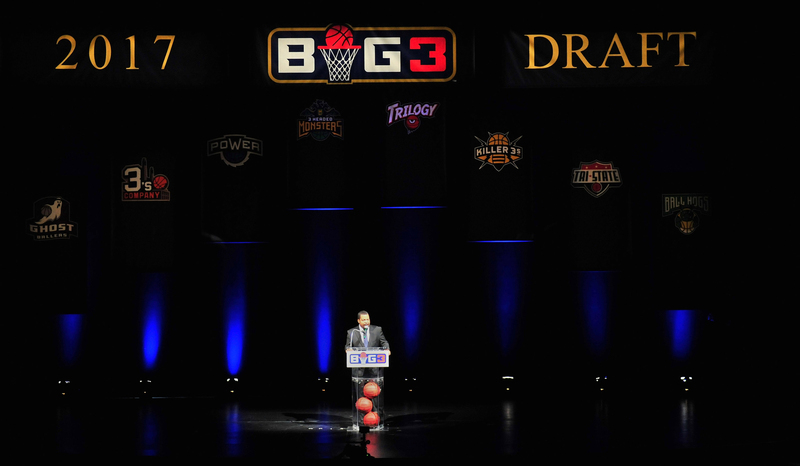 Actor/rapper Ice Cube addresses the crowd at the 2017 BIG3 basketball league draft at Planet Hollywood Resort & Casino on April 30 in Las Vegas. BIG3 is a real league. The competition is real. And the results are as unpredictable as they are exciting. Concepts for the BIG3 started on opposite sides of the country. On the East Coast there was Roger Mason Jr., a 2002 second-round draft pick for the Chicago Bulls who played for 10 years as a journeyman with teams such as the Toronto Raptors, San Antonio Spurs and the New York Knicks. After his final stint with the league in 2014, Mason joined the National Basketball Players Association as deputy executive director. While there, he spearheaded efforts to ensure that retired players had access to adequate health care. 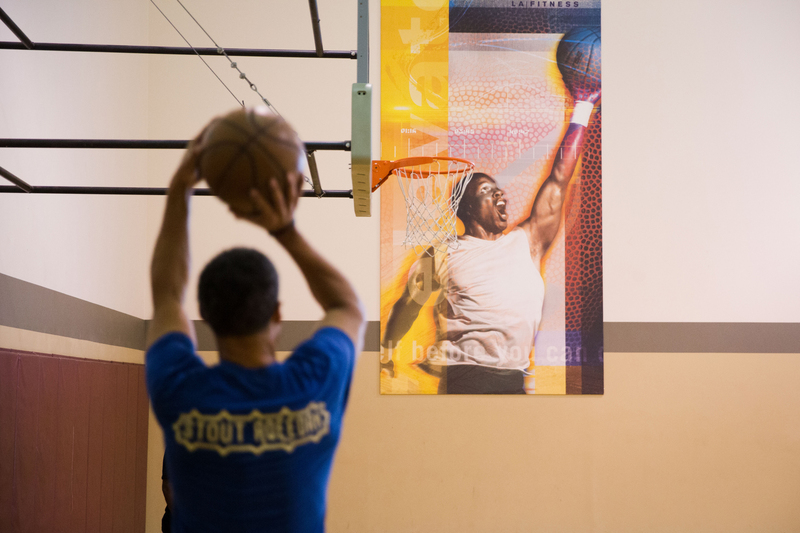 Mason also has a passion for entertainment and for evolving the NBA’s tech thumbprint. Mason was the mastermind behind the inaugural NBA Player Awards show in 2015. It aired on BET, was a huge success and is a precursor to next week’s Drake-hosted NBA Awards on TNT. The BET version was executive-produced by Jeff Kwatinetz (an interesting guy), founder of entertainment company The Firm. Kwatinetz is also COO of Ice Cube’s Cube Vision film production company. The BIG3 teams don’t represent particular cities. Instead, the league will travel from Barclays Center in Brooklyn, New York, to Charlotte, North Carolina, to Los Angeles, eight cities in total before the Nevada championship. Each stop will feature four games so every player gets seen. Think And1 Tour meets NBA basketball meets Harlem Globetrotters. It was up to Cube, Mason and Kwatinetz to make the league familiar to fans while embracing rules that would make the game different, and innovative. The first team to 60 points wins. Halftime starts after the first team scores 30 points. There’s a four-point shot spread out over different areas of the court beyond the 3-point line (Ice Cube’s idea). The BIG3 features the return of legalized hand-checking, taking the ball outside of the paint after defensive rebounds. Once the rules were set, the trio set out to find established names. Chief among them was Iverson. Allen Iverson was BIG3’s golden goose. Secure him and the league had its transcendent star. The 2001 NBA MVP and Naismith Memorial Basketball Hall of Famer was a human cultural landmark at the turn of the 21st century. His cornrows, baggy shorts, tattoos and hip-hop swag made him an icon. His name still resonates with NBA fans who remember the time he stepped over (now Cleveland Cavaliers head coach) Tyronn Lue in Game 1 of the 2001 NBA Finals and put Michael Jordan on skates in 1997. Even now, whenever Iverson shows up in public, whether it’s to retire his jersey in Philadelphia, or to conduct an interview, fans become enamored all over again. So grabbing The Answer was a major coup, even if he was reluctant to play at first. BIG3 is using his star power, producing a video series documenting his road back to basketball. Iverson obviously won’t be the same MVP he was in 2001, but any flashes of his previous greatness would make the BIG3 a must-watch spectacle. Creating new pro leagues is hard. Vince McMahon’s XFL was set to be an offseason professional football league and flamed out after its first season. Donald Trump’s United States Football League was a disaster. The American Basketball Association, formed in 1967 and possibly the most renowned competitor to a major league, lasted nearly a decade, starred Dr. J, and helped revolutionize the way basketball was played. The ABA merged with the NBA in 1976. For black folks, the dog days of summer, the season between June’s end of the NBA and September’s beginning of the NFL, are even more dogged because of the lack of sports they care to watch. One reason it’s so difficult to battle established leagues is the fan bases that have followed teams for decades. Starting new franchises and getting fans to buy in is a major hurdle. That’s where the BIG3 has an advantage: It’s using players such as Iverson and former Sacramento Kings guard Jason “White Chocolate” Williams, a fan favorite. These guys are franchises in their own right, with their own followings. It’s more about them than the team, which has been at the heart of the NBA’s recent success and can be a driving force in BIG3’s longevity. 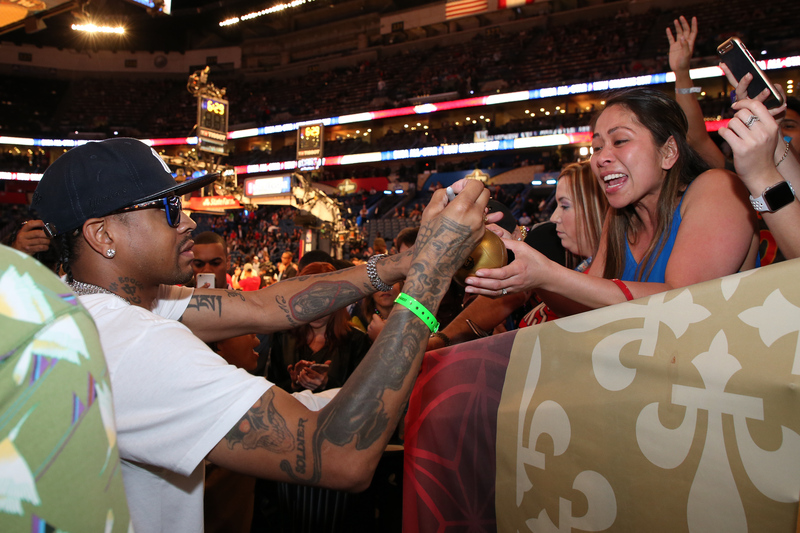 NBA legend Allen Iverson signs autographs before the NBA All-Star Game as part of the 2017 NBA All-Star Weekend on Feb. 19 at the Smoothie King Center in New Orleans. There’s also another important incentive for players to perform at their best: money. Yes, BIG3 is a real league with real contracts. Each player has signed a $100,000 contract for the year. The Basketball-Related Income is 52 percent of the league’s revenue, to be split at the end of the season. The championship team gets the lion’s share of the money. Each subsequent team gets a smaller cut. So players have the incentive to take the game seriously. But the biggest reason to expect the games to be competitive and intense is that the BIG3 is full of players who are out to prove doubters wrong. For every Chauncey Billups or Mike Bibby who wants to play versus his peers, there’s a Ricky Davis or Rashad McCants whose off-the-court reputations led to the premature demise of their pro careers. “I’m not in the league now because of executive reasons,” said McCants, who will be playing on Trilogy with Kenyon Martin and Al Harrington. McCants was drafted 14th in 2005 by the Minnesota Timberwolves after leading North Carolina to an NCAA championship the year before. By the ’07-’08 season, McCants was averaging just shy of 15 points per game and shooting 45 percent from the field. He was, however, outspoken and, fairly or not, had earned a reputation for being difficult to coach. And he was also the first athlete to publicly date a Kardashian, appearing as a guest in 2009 on Keeping Up With The Kardashians while dating Khloe. Rashad McCants of the Minnesota Timberwolves goes up for a shot against Yao Ming (No. 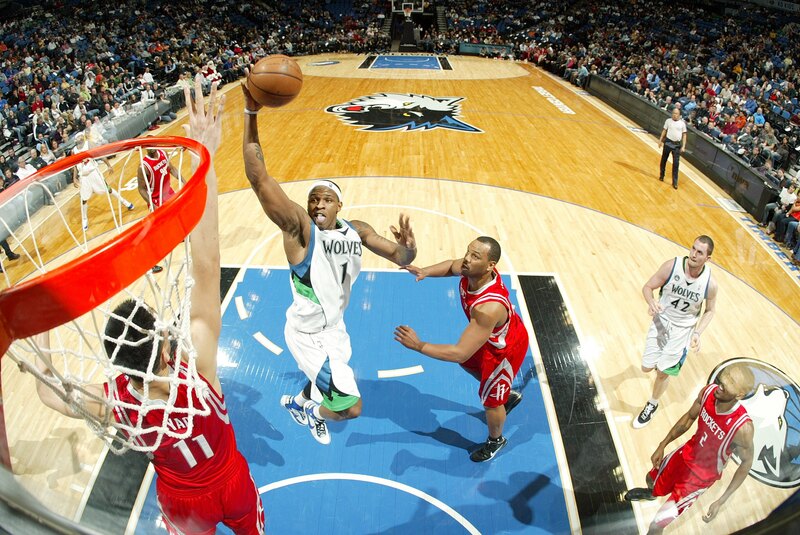 11) and Chuck Hayes of the Houston Rockets during their game on Dec. 20, 2008, at Target Center in Minneapolis. By 2009, just four years into his career, McCants was out of the NBA despite averaging 10 points a game. “Me being out of the league has nothing to do with my play. To not get calls for four years? Not even a meeting?” McCants also came under fire in 2014 for comments about the athletic program at UNC. He’s spent the last few years bouncing around international leagues and sees the BIG3 as a chance to show owners that they were wrong to pass on him — and to also give them a chance to rectify their mistake. There’s an outside chance that someone like McCants could put on a show good enough to land back in the NBA. It’s an outcome BIG3 leadership fully encourages. BIG3 is a real league. The competition is real. And the results are as unpredictable as they are exciting. Abdul-Rauf’s story has become part of sports lore. He was drafted by the Nuggets in 1990 as the third overall pick and soon became known as one of the league’s most feared streak scorers, infamously dropping 51 points on John Stockton’s head on a frigid December Utah night. The Mississippi native’s scoring prowess was so legendary that Phil Jackson tweeted in February 2016 that Stephen Curry reminded him of a young Abdul-Rauf. Then in 1996, it all came crashing down. 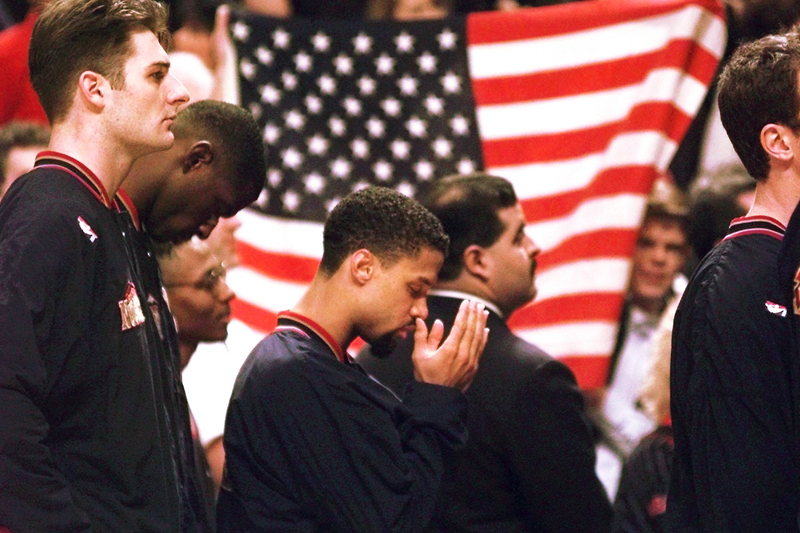 Denver Nuggets guard Mahmoud Abdul-Rauf stands with his teammates and prays during the national anthem before the game against the Chicago Bulls on March 15, 1996, in Chicago. Abdul-Rauf, saying that the U.S. flag was a symbol of “oppression and tyranny,” was suspended Tuesday for sitting down during the national anthem. Friday was Abdul-Rauf’s first game back. That’s when the star point guard decided not to stand for the national anthem, citing that the flag and what it represents was in conflict with his Muslim faith. This prompted the NBA to suspend him for a game, costing him $32,000. The league eventually let him bow his head and pray during the anthem. By the end of that season, he was traded to the Sacramento Kings. He was out of the league by 2001, unable to even get meetings with other teams. There’s no question his protest caused his career to end — and that’s even more apparent by the fact he’s closing in on 50 and still giving buckets to players a generation younger than him. That quickness and stamina wowed his competition and coaches at the combine. “I was curious to see if I could get my shot off,” he recalled. “I haven’t played against a lot of these guys, and they’re in their early 30s. By the grace and mercy of God, I didn’t have any problems.” Abdul-Rauf is the oldest player in the BIG3. Mahmoud Abdul-Rauf trains for the start of the BIG3 league at LA Fitness. While Abdul-Rauf was showcasing his skill and endurance on one side of the court, leading him to be drafted 17th (out of 24 players) by Payton’s 3 Headed Monsters, McCants was engaged in 3-on-3 scrimmages that were beginning to get heated. A referee made a questionable call in a game involving McCants, Corey Maggette, Stephen Jackson and others. Players got in the ref’s face, players got in each other’s faces, and the scrimmage deteriorated into a full-on scrum. The physicality and competitiveness set a tone for how the games might be played: physical NBA-style basketball that encourages trash-talking and ruggedness. What people may not realize is the fact that even though games are half-court and involve six players instead of 10, the cardiovascular toll can be greater than in a traditional game. For one, there’s a 14-second shot clock, which means attempts are going up rapidly and players are scrambling for rebounds. Also, no one can hide on defense. Defenders have to square up and create stops without much help. And with just six players on the court, everything is more spread out, so players have to cover more ground. Just shooting around? It won’t be enough. Players will have to show up to games in the best shape they’ve been in since they were in the NBA. It’s impossible to predict the long-term success of a league like the BIG3. For Cube and Mason, if players get a chance to show off their talent and fans are entertained, then the BIG3 will find a winning formula. For Abdul-Rauf, the sustainability of the BIG3 means a chance to do something altruistic for members of the exclusive NBA fraternity — en route to making those summer days less dogged for fans. 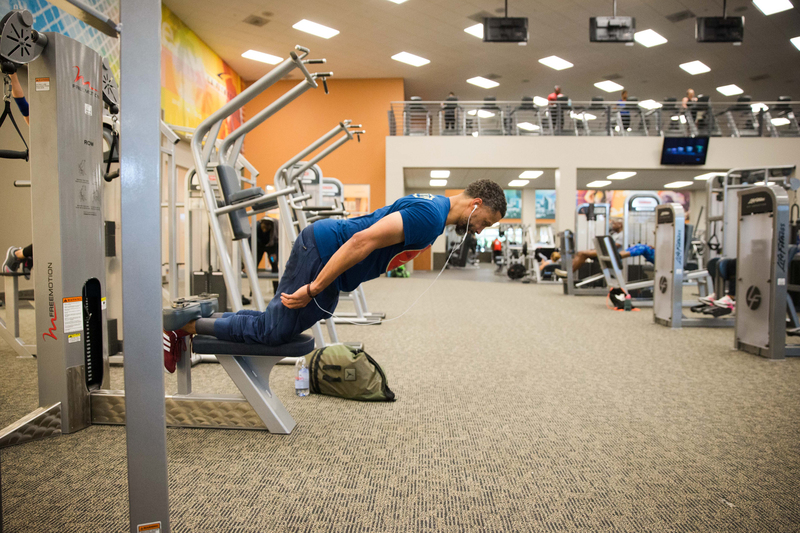 Former NBA player and current BIG3 player Mahmoud Abdul-Rauf trains at LA Fitness.